The June 2017 Greater Atlanta Coin Show saw some new faces among the visitors and some new dealers as well. All the dealers filled their showcases with numismatic and collectible items for viewing, buying, selling or trading. This month's show wasn't as busy as earlier shows, but it was also the start of vacation season after the school year ended in the area. We understand. We appreciate all of our visitors-new ones, returning ones and the vacationers. And, we hope that those vacationing had a good time and look forward to seeing them again at future shows. We also appreciate our dealers - our regulars and our visiting dealers. Thank you all. Of course, we don't forget, we appreciate our security each month and the hotel's staff for the space. As for people, we had a father and young son team new to the show. After seeing the size, the displays and the variety of collectibles, they were surprised and exclaimed, "Are you here like this every month?" Yes, the show returns every month. This happens to be our 30th year of monthly coin shows, and our dealers fill the bourse each month with a wide variety of numismatic and collectible treasures. For the June show, the weather also produced a variety from sunshine -not much-, to light rain to heavy rain, transitioning from one to another during the day. With the metals markets still bumping along in the $16s to $17s for silver and the $1200s for gold, many of our visitors looked for gold and silver either in collectible coins or in bullion form. Dealers understanding the interest in gold and silver always provide those options, however they also always provide the rare and collectible numismatics as well. Let's take a virtual tour of some of the rarities at the June show. Note: we hide the certification numbers and identifying serial numbers to protect the numismatics and the collectors from nefarious acts. The US Mint produced the capped bust half dime designed by John Reich and engraved by William Kneass in Philadelphia for the years 1829 - 1837. 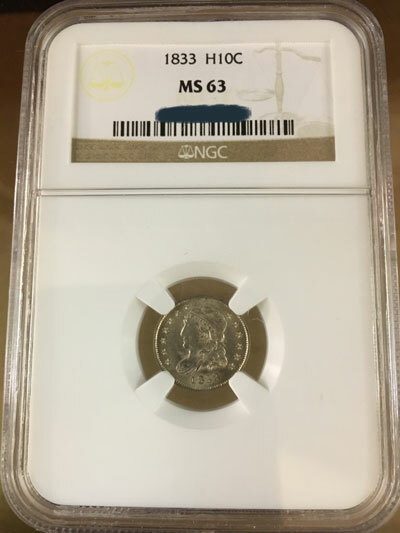 The Numismatic Guaranty Corporation (NGC) graded this specimen as MS-63. The Red Book defined the MS-63 Choice Uncirculated for the capped bust half dime as "No trace of wear. Light Blemishes. Attractive Mint Luster." 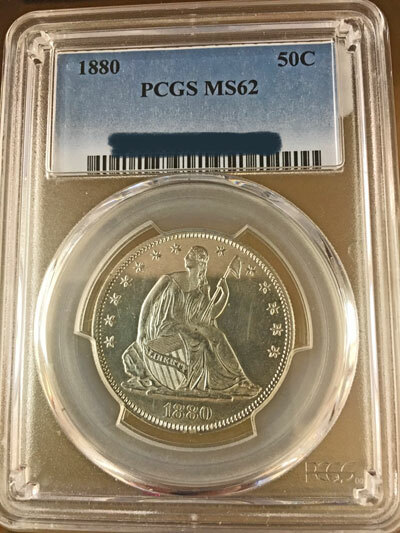 "This is another fairly plentiful entry in the Capped Bust Half Dime series. The published mintage includes some dated 1832, but the use of three obverse dies and seven reverses indicates that plenty were minted with the date 1833. Like the example illustrated, many of these coins are poorly struck at their centers. "The same press might coin half dimes one day, dimes the next, and then half dimes again the day after that. Thus, the dies were frequently removed from the press, shelved and then reinstalled. Little care was taken to use the same die pair each time, with the result that the known dies for this date produced a total of 10 marriages." The US Mint struck this next coin designed by James B. Longacre, as the first of the small cents. The Philadelphia Mint coined just over 42 million of these cents for all three years, 1856-1858, of production. 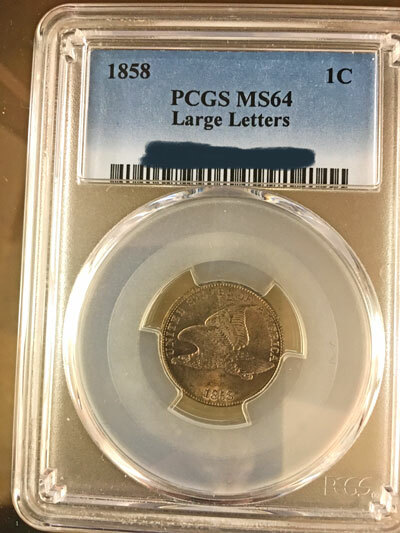 The Professional Coin Grading Service (PCGS) graded this coin as MS-64, Large Letters. "The popularity of the 1857 Flying Eagle Cent proved conclusively the concept of the Small Cent. After 1857, the Large Cent was discontinued and the Mint turned out Small Cents in record numbers in 1858, this time topping 24 million coins. "Three major varieties appear on 1858 Small Cents: Small Letters, Large Letters, and 1858 over 7. On the Small Letters variety, the A and M of AMERICA are completely separated; on the Large Letters variety, the A and M are connected at their bases. "Based on the PCGS Population Report, the Large Letters variety appears to be the most common (the Small Letters has a population that is 58% lower than that of the Large Letters). "In Mint State, the most frequently seen grade is MS-64, followed by MS-63. The finest Large Letters 1858 Flying Eagle Cent certified by PCGS is a single MS-66." The PCGS rarity scale estimates between 2001 and 2500 of the Flying Eagle cent coins remain in MS-60 or above condition. The US Mint produced the Liberty Seated Half Dollar coin from 1839 - 1891 at their Philadelphia, New Orleans, San Francisco and Carson City locations, though not at all four mints for all of the years. "An impaired or dull luster may be evident. Clusters of small marks may be present throughout with a few large marks or nicks in prime focal areas. Hairlines may be very noticeable. Large unattractive scuff marks might be seen on major features. The strike, rim and planchet quality maybe noticeably below average. Overall eye appeal is below average." Plus, PCGS assigns a survival rate of roughly 200 of the Liberty Seated Half Dollar coins in MS-60 or greater grades. Though it may have detracting characteristics, this 137-year-old coin is still in an MS-62 condition, in other words, a nice coin. The US Mint began producing the Morgan dollar in 1878 and continued to 1921. During this time span, the Philadelphia, New Orleans, Denver, Carson City and San Francisco locations struck between 600 and 700 million of the beautiful Morgan Dollar coins. PCGS graded this coin as MS-66+, which means it is better than MS-66 but not quite an MS-67 coin. In addition, the green CAC (Certified Acceptance Corporation) sticker certifies the coin as "solid or premium quality for the assigned grade." "The 1883-CC $1 is one of the most common dates issued by the Carson City Mint. Large quantities of full bags of $1,000 face value appeared in the 1960s in U.S. Treasury vaults, accounting for most of the known population. "These were distributed in the late 1970s and early 1980s by the General Services Administration, which sold individual coins to dealers and collectors. Today, they are extremely common and can be found with ease in all Mint State grades up to MS67+. 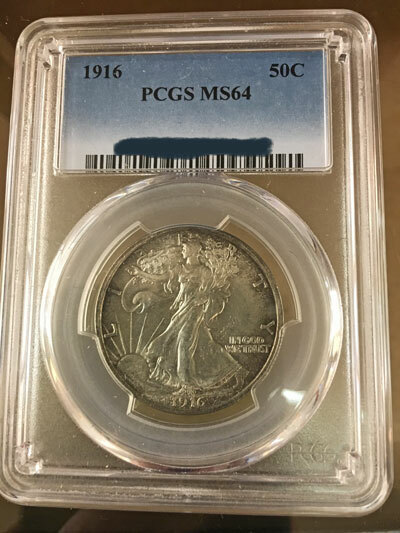 "The most frequently-seen grade is MS64, where PCGS alone has certified over 15,000 examples (as of July 2015). In general, coins of this date show strong strikes and deep, frosty luster." PCGS lists an estimated population of 34,000 1883 CC dollars in an MS-65 and higher grade. For those who like toning, this specimen also has beautiful color. Next, we have another Seated Liberty Half Dollar coin struck by the Philadelphia mint as proof. "Shows an attractive high quality of mirror (or other style Proof surface and strike for the date and mint. A few small scattered contact marks, or two larger marks, may be present, and hairlines may show under magnification. Noticeable light scuff marks may show on the high points of the design. Overall quality is above average and overall eye appeal is very pleasing." "In 1885, a mere 6,130 half dollars were coined at the Philadelphia Mint. Of those, 5,200 were mint state, with the remaining 930 struck in proof. However, even with such a low business strike mintage, many were put away at the time, which makes this issue actually more common in mint state than not. The proof issue is actually more common today however, with just over 300 in the NGC census compared to only 75 mint state coins." 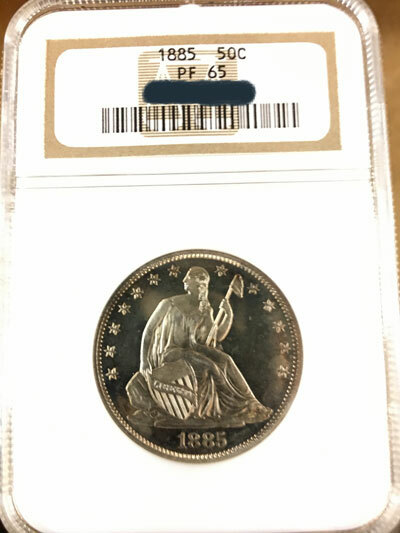 A 132-year-old coin in a Proof-65 grade with a population of 930 is a very nice coin to add to any collection. The US Mint struck this type of half dollar, also known as the Barber Half Dollar, from 1892 to1915 at the Philadelphia, Denver, New Orleans and San Francisco locations. The Denver mint produced this particular example along with 3,279,999 others. 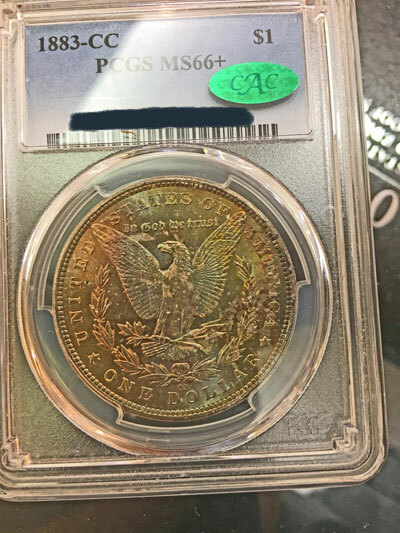 NGC graded this almost 110-year-old coin as an MS-65. "No trace of wear; nearly as perfect as MS-67 except for some small blemishes. Has full mint luster but may be unevenly toned or lightly fingermarked. A few nicks or marks may be present." 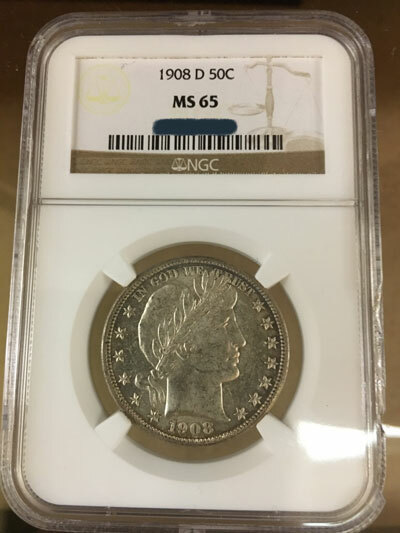 In their population statistics, NGC has graded a total of 18 of the 1908-D Liberty Head half dollar coins as MS-65 and only six in the higher grades. From the PCGS web site, David Hall describes the two coins. "The first year of issue for the Walking Liberty half dollar series. Like many first year of issue coins, many were pulled out of circulation and saved as 'novelty' items. However, for the 1916 half dollar the original mintage of 608,000 coins was relatively small for the era, and a half dollar was certainly more money at the time than the smaller denominations, so not as many were saved as say the 1913 Buffalo nickel or 1916 Mercury dime. Those that were saved at the time were mostly pulled out of circulation, so they are what we can AU (Almost Uncirculated) today. "The 1916 half dollar is scarce in circulated grades and, like all early (1916-1929) Walkers, sells for much more than the later dates in circulated grades. This issue, along with the 1916-D and 1917, is one of the more available of the 1916-1928 dates in mint state condition. "Gem MS65 or better examples are available, but are certainly not common. In Gem condition, this isuue is slightly easier to find than the 1916-D and is rarer than the 1917. Most examples are well struck for an early date Walker. Luster is typically satiny and white luster Gems are not unusual. An important beginning for this great coin series." "In circulated grades, the 1916-D is about of equal rarity as the 1916, even though the mintage is almost twice as many coins. Both coins are much rarer, or at least sell for more, than all but a few of the dates that follow. "In Gem condition, the 1916-D is slightly rarer than the 1916. Most mint state examples are well struck. Luster is the 'satiny look' often seen on the earlier date Walkers." Of additional interest, the 1916 and some 1917 versions of the Liberty Walking half dollar coins showed the mint mark on the obverse under the motto. For the remainder of the 1917 half dollars through the end of production in 1947, the Mint moved the mint mark to the reverse under the eagle's tail feathers. 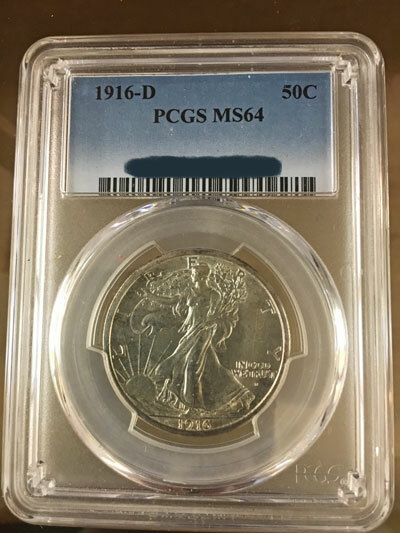 PCGS estimates the survival rate at 4000 in grades above MS-60 for both the 1916 and 1916-D Liberty Walking half dollar coins. Certainly, these two specimens showcase the workmanship of Mr. Weinman and the US Mint and illustrate the longevity of the design's beauty. The next two coins came from the first year of the new half dollar designed by Adolph A. Weinman showing Liberty walking into the dawn of a new day. "Her right hand is outstretched in bestowal of the spirit of liberty to the land of the free and the home of the brave." These two coins, one from the Philadelphia mint and one from the Denver mint, still shine as PCGS certified MS-64 examples over 100 years later. The next two coins are different versions, but the US Mint struck both to commemorate the centennial of Missouri joining the Union of states. PCGS certified each of these examples as MS-63. 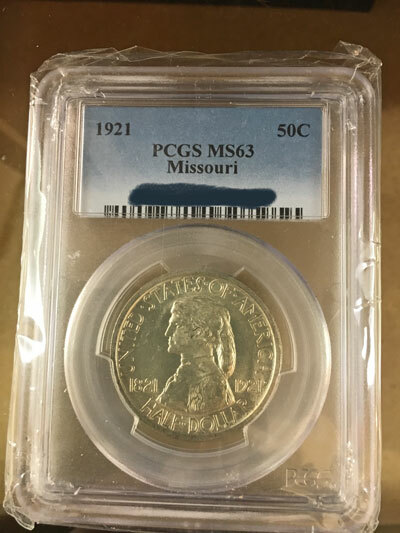 "The 1921 Missouri was struck to commemorate the 100th anniversary of Missouri statehood. A very large mintage was authorized but many were melted as unsold. There is some controversy as to the actual 'distributed' mintage and even experts disagree. 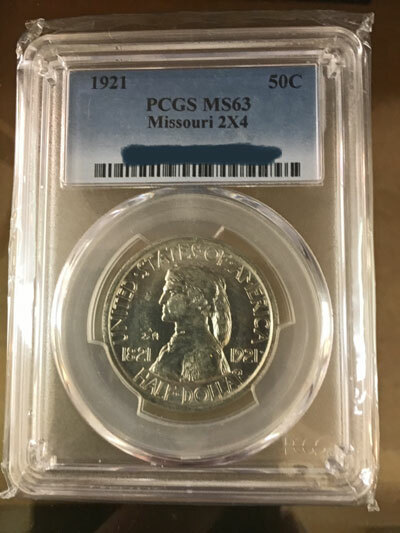 "To add to the confusion, there are two varieties of the Missouri and the exact mintage breakdown between the two is speculative. "The two varieties are one with a 2 and a 4 struck into the obverse field with a star between the 2 and the 4. In numismatic circles, this variety is known as the 'Missouri 2 by 4'. "The other variety does not have the 2*4 in the field and is known as the 'Missouri plain'. "The 2 and 4 were meant to signify that Missouri was the 24th state admitted to the Union and the idea was to have the 2 by 4s sell for a premium to defray the cost of production. "But as it turned out, both varieties were sold at an original price of $1.00. "Whatever the true distributed mintage, the two Missouris are among the rarest issues in the silver commemorative series. "For the Plain Missouri, the typical grade can range between AU50 to MS64. MS65 specimens are somewhat rare and Superb Gem MS66 examples are truly rare. Marks are usually not a problem with this issue. "Strike can be somewhat of an problem, but the real issues with Missouris is eye appeal. Frosty, full luster Gems are much rarer than dull or toned examples. Many Missouris have varying degrees of toning, some natural, some otherwise. But many of the toned Missouris are quite dark. Serious collectors should hold out for a frosty white Gem or an attractive, naturally toned piece. "The Missouri 2X4 is one of the key issues in the silver commemorative series. Missouri 2X4s range in grade from AU to MS65 on average. The MS65s are rare and Superb Gem MS66 examples are very rare. Missouri 2X4s can be frosty or toned. Frosty, original examples are definitely the exception. And the toned Missouris can often be dull and unattractive. The premium specimens are the frosty white or the attractively toned pieces." The Red Book lists the distribution mintages as 9,400 for the 2x4 and 11,400 for the plain version. Oddly, PCGS shows a surviving estimate in the MS-60 or higher grades as 4,100 for the 2x4 and 6,250 for the plain versions. These two examples provide excellent representations of the Missouri Centennial Commemorative Half Dollar coins. The next coin is another low mintage classic commemorative silver half dollar coin for the Old Spanish Trail. PCGS certified this specimen as MS-65. "The1935 Old Spanish Trail half dollar was designed by a collector, L.W. Hoffecker (later, 1939-1941, President of the American Numismatic Association) to be sold to collectors at the relatively high price of $2.00 per coin. "It was somewhat of a contrived issue (as were quite a few other silver commems in the 1935-1939 era) and Hoffecker was involved in the distribution, and therefore the profit made, of the coins. "Nonetheless, the Spanish Trail was quite popular with collectors at the time of issue and indeed for all of the years following to the present. It was a good design and the quality is generally quite high. "The Spanish Trail is certainly not rare in an absolute sense. However, the 10,000 coin mintage is very low for a commemorative type issue. "Commemoratives of the classic 1892 to 1954 era have always been collected two ways; there is the 50 piece one-of-each-type set and the 144 one-of-each-date-mint mark-and-variety set. 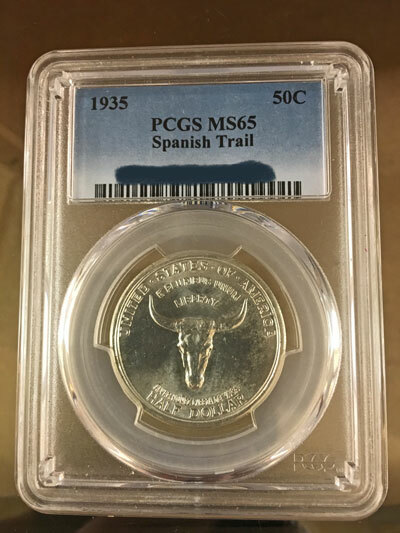 "For the 50 piece type set, the Spanish Trail has one of the lowest mintages and it has been highly sought after as a key to the series, especially in the days prior to the PCGS Population Reports (pre-1986) as PCGS grading shed light on which coins were saved and which were actually much harder to acquire in top condition than their original mintages might indicate. "The typical Spanish Trail grades MS64 to MS66, and MS67s are also fairly available. The surfaces are usually relatively mark-free as the "high" original price probably caused buyers to take care of their coins. Luster is of the satin type. This is an issue that generally comes very nice." Of the 10,000 distribution, PCGS shows an estimated survival rate of all grades at 8,250 and 4,000 for grades MS-65 and above. Just look at the luster on this specimen, its silver content has not toned as many of the older commemoratives have, though many people find colorful toning adds its own beauty to old coins. 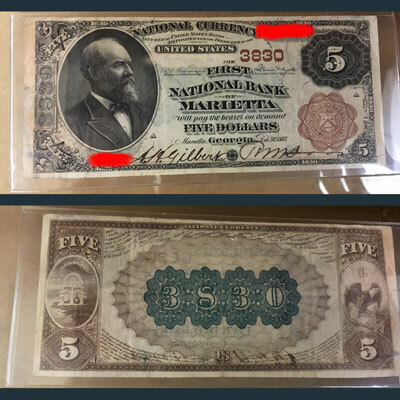 Our last example from the June 2017 Greater Atlanta Coin Show is a $5 Note from the First National Bank of Marietta. This is a Brown Back Second Charter Period Large Note. The National Bank Notes occurred in three charter periods and included eleven types of notes. For all except one bank, the title of the bank on the note had to include the words "national" and "bank." The Bank of North America was the exception to the rule. Though eleven types of notes, the variety of the bank names reflected the imagination and braggadocio of the bankers. The Second Charter Period extended form July 12, 1882 to April 11, 1902. A series of new designs produced new $5, $10, $20, $50 and $100 notes, and legislative actions during the period resulted in three distinct types of Second Charter Period Notes. This Marietta Note is from the first type of Second Charter Period Notes and is a Series 1882 with Brown Seal and Brown Back. The name describes the fact that the back and the seal are both printed in brown ink. On the back, the bank's charter number is overprinted in blue-green. The seal of the state of the bank issuing the note appears on the left side of the back with an eagle on the right side. The bank's charter number is also printed in brown on the front of the note and engraved six times around the edges as a way to identify the issuing bank when redeeming torn and mutilated notes. These large $5 notes were printed in sheets of four and the position of the notes were identified by letters on the notes - A for the top position and D for the bottom. This Marietta note shows an "A" for its position on the sheet. The First National Bank of Marietta was chartered in December 1887. As such, the note's date is 1887 using the Series 1882 design and characteristics. This bank issued 5036 of their $5 notes for a total value of $25,180. They also issued $10 and $20 notes, some large, and in 1929, some small sized. Their overall total currency was $1,756,600. As of 1935, $4,225 of the First National Bank of Marietta large $5, $10 and $20 notes remained out. Now, 82 years later, wonder how many of these notes still exist. This Second Charter Period note included signatures of Rosecrans and Hyatt from the U.S. Treasury Department, but it also included signatures of the Cashier and President of the Marietta bank. For the early notes, the Cashier and President signed their names in ink. Later, they applied their signatures with an inked stamp. This note historically came from the area and illustrates part of the history of our currency. Information Source: National Bank Notes by Don C. Kelly. The June Greater Atlanta Coin Show offered visitors a broad cross section of coins, bullion, currency and other collectibles - many more than the few mentioned above. Join us on Sunday, July 9, 2017, to see the many old and new numismatic and collectible treasures on the coin show's bourse packed with dealers and their showcases.